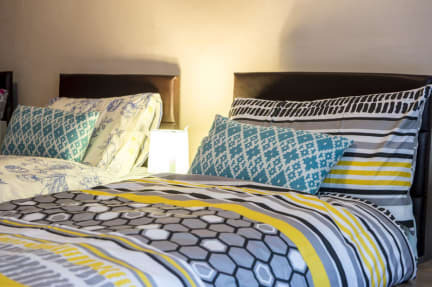 Syozant Drumdryan Central, an ideal base for family and friends visiting Edinburgh located in city centre close to all amenities and attractions with private entrance. Most of the city attractions can be easily reachable by walk. Also comes with fully equipped Kitchen with an 4-seater dining table. Ground floor flat with wheel chair accessible. We offer free WiFi throughout the property. 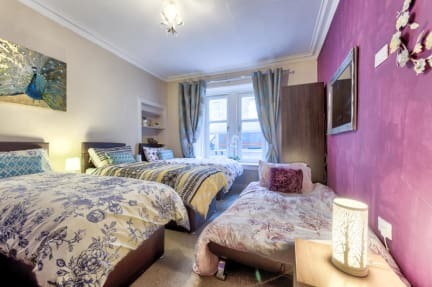 Location can't be beaten - this apartment is within easy walking distance to all the major attractions including Edinburgh Castle, Prince Street shopping, Royal Mile, Holyrood Palace, Grassmarket, Old Town area, top theaters (including the Edinburgh International Festival Theatre), world class museums and art galleries etc. Also surrounded by full of great pubs, coffee houses, boutique shops, gymnasiums, cinema complexes and restaurants. The rooms are very colourful and comfortable. All 3 Bedrooms got an wall mounted SmartTV and DVD Player with one double bed, four single beds, two sofa bed and full Bathroom with Bath Tub.